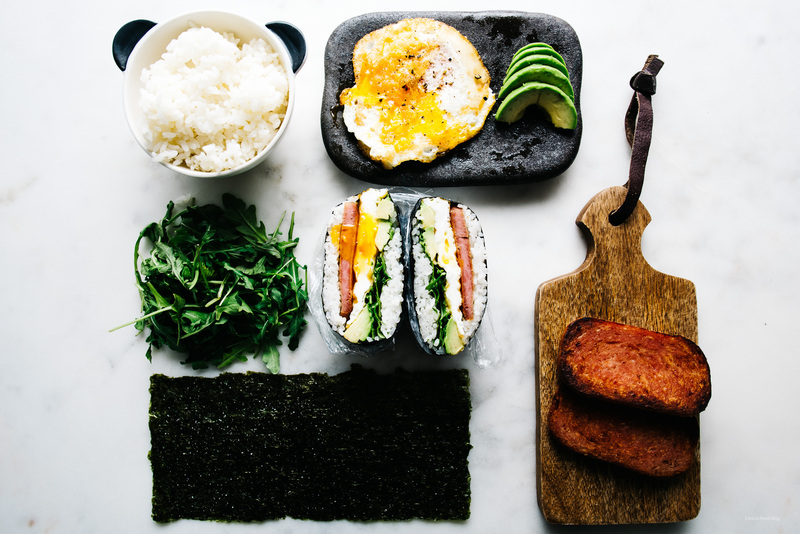 It’s the land of spam musubi. I’m going with Alana, Molly, and Lily! I’m going to eat all of the things, maybe climb a mountain, and hopefully tan my pasty legs. 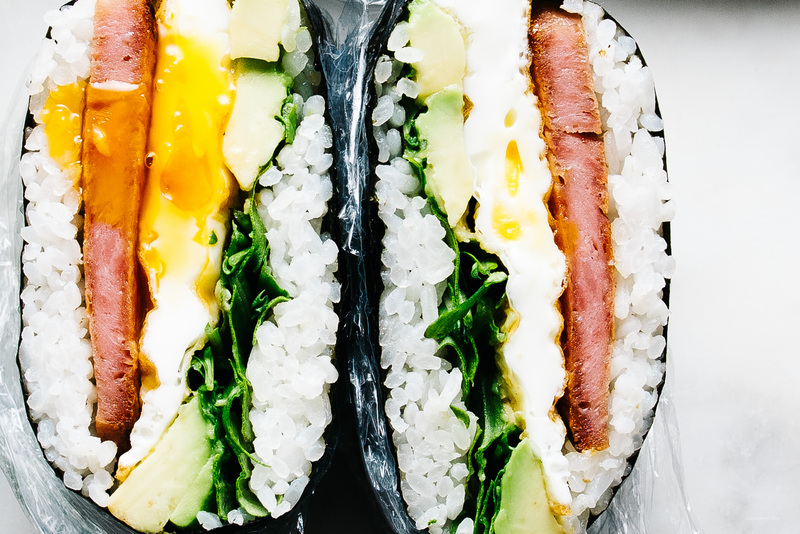 I’m thinking that we are going to need a lot of snacks to fuel our adventures and maybe even food to eat on the plane, so I’m going to be bringing (okay, not literally bringing) these spam and egg onigirazu. Have you guys heard of onigirazu? 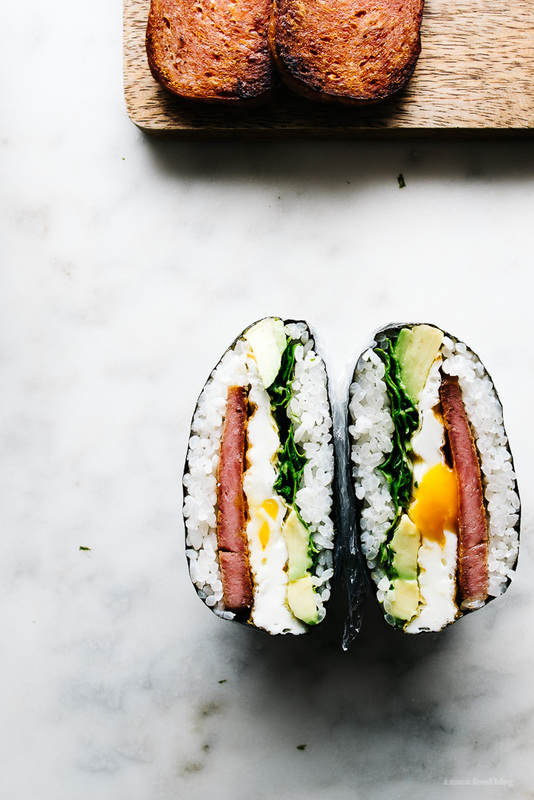 They’re kinda of like onigiri but more sandwich-like and not as finicky. It’s super easy to make them and you can fill them with anything you want. You can make a bunch of customized ones, pack them up in a cooler and go on a picnic, hopefully on Hawaii! I made this handy gif to show you how to make onigirazu so I hope you run with it and fill them with your heart’s desire. In the meantime, I’ll be packing and researching where to go and what to do. Suggestions are welcome – we’ll be hitting up Maui and Oahu. Oh, and don’t forget to check out Alana’s Furikake Snack Mix, Molly’s Roasted Pistachio Chocolate Bars, and Lily’s Super Green Matcha Cacao Truffles. I can’t wait to eat them in real life! 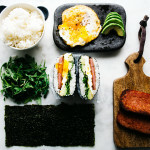 PS – I realize I’m the weird one who brought spam to the party…but what’s Hawaii without spam?! 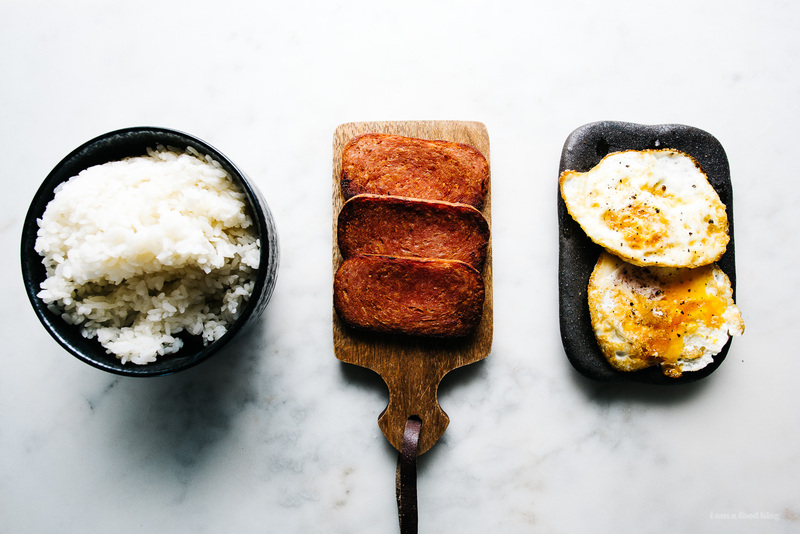 Start off by cooking the piece of spam in a non-stick pan over medium heat. Cook until crispy and golden, about 2-3 minutes per side. Remove from the heat and let drain on a paper towel. Wipe the excess spam oil out of your skillet and heat it up over high heat. Add a bit of oil (I prefer grapeseed) and cook your egg over aggressively high heat until the whites start to set, bubble and crisp up. Carefully flip and cook the other side for 1 minute. Remove from the pan. Lay the seaweed, shiny side down, on a sheet of plastic wrap. Take half of your rice and shape into a round in the middle of the seaweed. Lightly season the rice with a bit of salt. 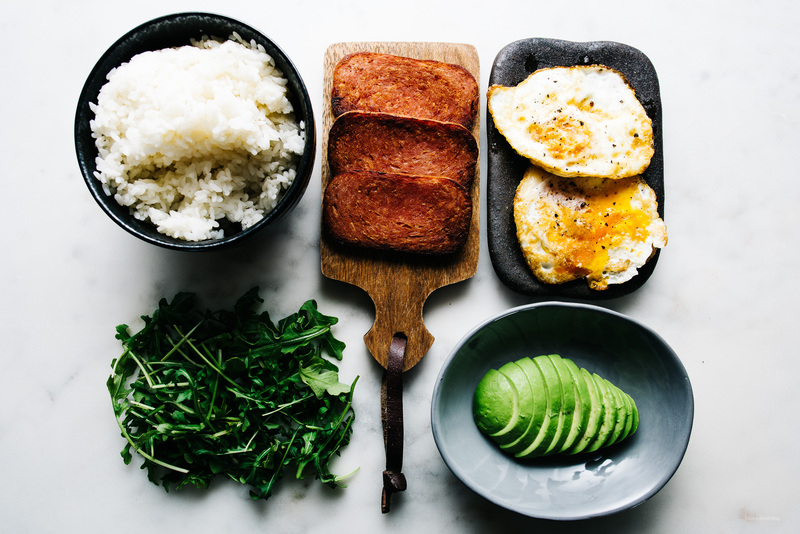 Place the spam, egg, avocado slices and a handful of arugula on top. Top with the remaining rice. Fold in the four corners, using the plastic wrap to tighten, making a square package. Let sit for a while for the seaweed to soften, the cut in half with a sharp knife. Enjoy! Onigirazu!!! How have I lived without them? Perfect plane food! So excited. Think of all the things we could put in them, for all the adventures we’re about to have. Onigirazu for every day of the week! Gah. Cannot wait to be on the plane with you! heehee. let’s make a super healthy one for you with avocados and all the good greens….can’t wait to maui with you babe!!! We should make these before we go like forreal cause SPAMMM!! So excited for Maui adventures!! I can’t wait to squeeze you irl! So soon! thanks for the suggestions lindsay-jean! Oh man, this looks legit. 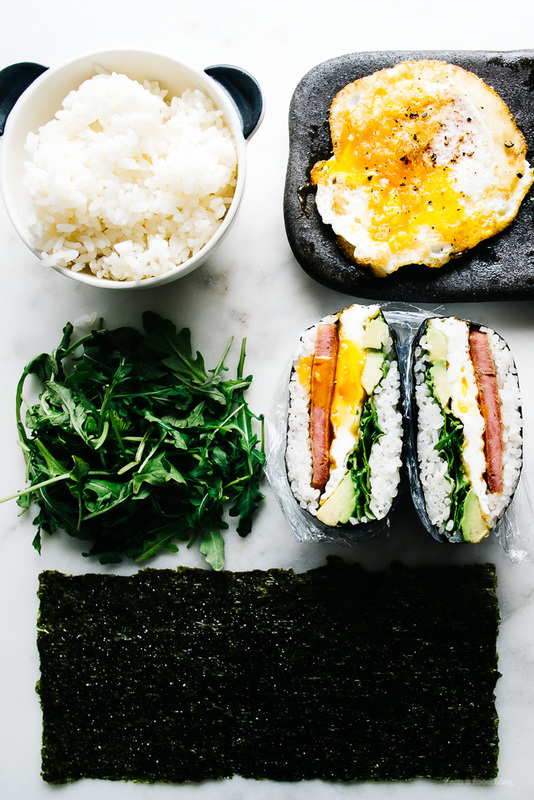 So… I’ve been to Maui and Kauai, and must have been looking in the wrong places bc I had a seriously difficult time find spam musubi there… like, an easier time in Seattle. So i hope you find all the musubis and have a fantastic time, and even if you fail in the musubi dept, there’s plenty of sun, sand, surf, and shave ice to make up for it!!! OH MAN. I can’t get over how much I love this – and how excited I am that you’ll be visiting Hawaii for the first time! i meeeeean, they do look like they would hold up on an airplane from, say, vancouver to los angeles :-P or would customs stop you at the spam??? oh and HAY what’s up with the p.p.s.?! i am going to CONQUER SPAM on this trip while we tan our pasty white legs, thankyouverymuch. i am so excited. extra spam for me, please. Ah Hawaii is my favorite place on Earth! There are so many food places to visit. In Honolulu you should look up this little takeout place that specializes in spam musubi and check out the food trucks in Haleiwa! Delicious! I might try replacing spam with smoked salmon, to check what’s going to happen. I make these all the time with your miso tuna recipe and fresh sprouts! Oh my gosh, these look unreal and are exactly the kind of thing I would TOTALLY want to bring on a plane. Secret plane-snack genius over here!!! Hope y’all have a blast! I’ve never eaten Spam. Maybe I should go to Hawaii? I’m going to Hawaii as well! I’m so excited, I can’t wait to just eat my weight in acai bowls and island food.